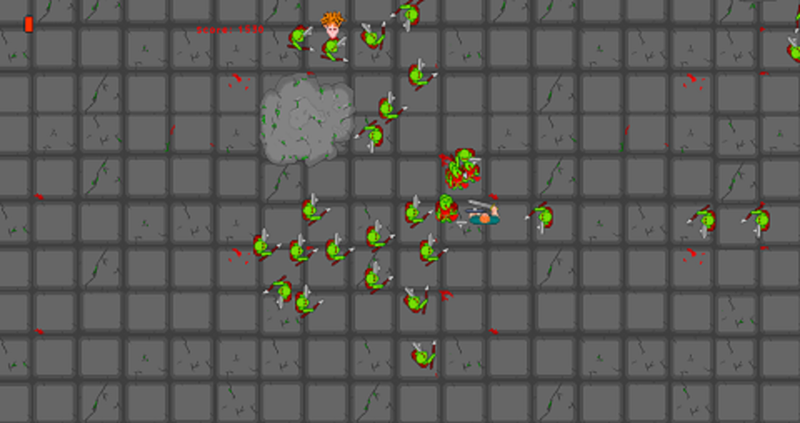 Demon War Survival is a Gauntlet / smash tvstyle 2d shooter, fight through hundreds of enemies with differentabilities and attacks, avoid different traps to face the orcwarlord and free your people. The Demon war has begun! The four Mages of the Blood Stars have called forth a demon tobring the world to chaos so they can rise to power. The demon useshis powers to urge all manner of creatures to war throughout theworld. One of the first incidents of the Demon War is the invasion of Orcsand Goblins along the edge of the Red Fang Forest. Many undefendedvillages are razed with the inhabitants slaughtered, while othersare taken prisoner. Your village was attacked in the night without warning or chanceof defence. You and your kin have been taken prisoner and are nowheld in the Warlords dungeon deep in the forest. Every day yourfriends and family are dragged from the dungeon and you hear theiragonized screams as they are butchered and tortured in the arenabefore being fed to the gathered creatures. The Warlord is increasing his army by using your people as baitto enable him to invade deeper into the kingdom of Ulberon. On theeve of your turn in the arena a stranger appears and gives you apowerful sword. Before you can ask anything they disappear. 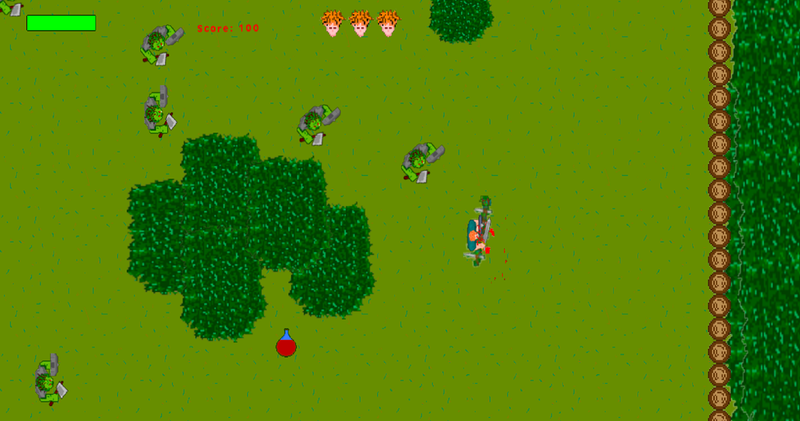 Its nowup to you to defeat the Warlords armies, saving your people and thelarger world from the Orc Warlords evil menace. Demonwar Survival is inspired by indie games from the 80s such asgauntlet and smash tv, films such as the hobbit and Lord of therings, and books by R A Salvatorre. Orcs and goblins are the mainenemies with 5 types of each while Trolls also figure later on. Fight your way through hundreds of enemies to confront the OrcWarlord himself and take revenge. Hidden traps await and will skewer the unaware. 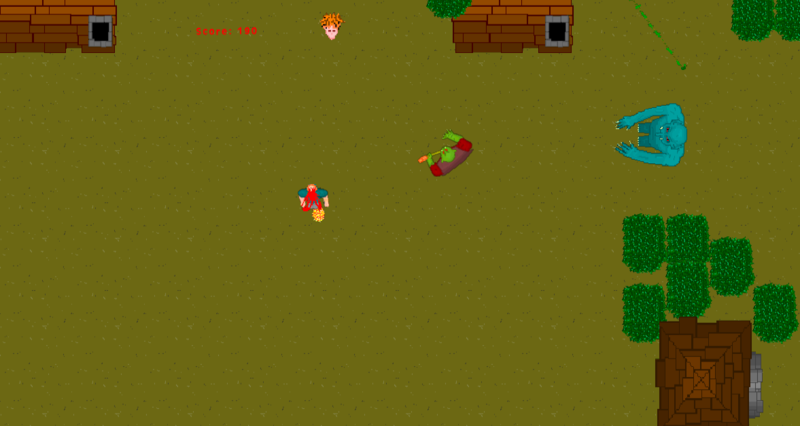 Avoid arrows, knives, axes and fireballs while using yourmagical sword to deal death to your foes. 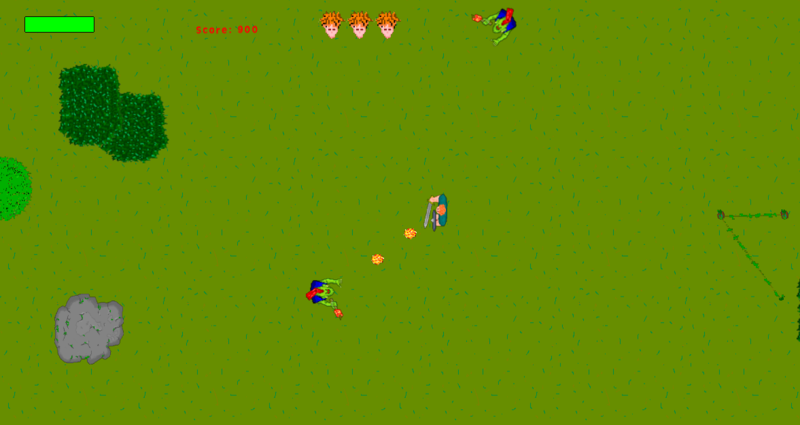 Use potions, extra lives and power ups to survive longer anddestroy stronger enemies. Use different tactics for different levels with differentenemies to defeat them and progress in the arena. Multidirectional shooting independent to movement and momentumallowing you to slay more enemies chasing you. 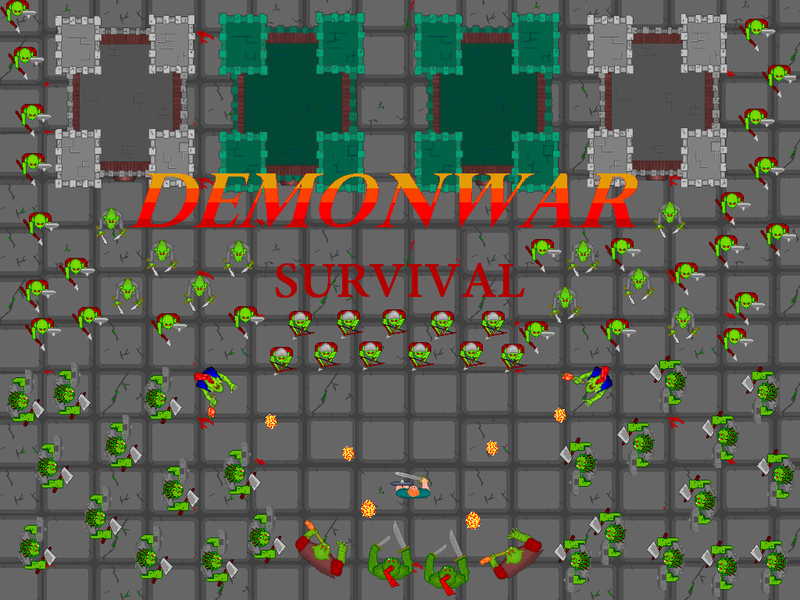 Demonwar Survival is the first in a line of more titles we wouldlike to bring you, please give feedback to help us give you thebest experience in this and future games. Demon War Survival is a Gauntlet / smash tvstyle 2d shooter, fight through hundreds of enemies with differentabilities and attacks, avoid different traps to face the orcwarlord and free your people.The Demon war has begun!The four Mages of the Blood Stars have called forth a demon tobring the world to chaos so they can rise to power. The demon useshis powers to urge all manner of creatures to war throughout theworld.One of the first incidents of the Demon War is the invasion of Orcsand Goblins along the edge of the Red Fang Forest. Many undefendedvillages are razed with the inhabitants slaughtered, while othersare taken prisoner.Your village was attacked in the night without warning or chanceof defence. You and your kin have been taken prisoner and are nowheld in the Warlords dungeon deep in the forest. Every day yourfriends and family are dragged from the dungeon and you hear theiragonized screams as they are butchered and tortured in the arenabefore being fed to the gathered creatures.The Warlord is increasing his army by using your people as baitto enable him to invade deeper into the kingdom of Ulberon. On theeve of your turn in the arena a stranger appears and gives you apowerful sword. Before you can ask anything they disappear. Its nowup to you to defeat the Warlords armies, saving your people and thelarger world from the Orc Warlords evil menace.Demonwar Survival is inspired by indie games from the 80s such asgauntlet and smash tv, films such as the hobbit and Lord of therings, and books by R A Salvatorre. Orcs and goblins are the mainenemies with 5 types of each while Trolls also figure later on.Fight your way through hundreds of enemies to confront the OrcWarlord himself and take revenge.Hidden traps await and will skewer the unaware.Avoid arrows, knives, axes and fireballs while using yourmagical sword to deal death to your foes.Use potions, extra lives and power ups to survive longer anddestroy stronger enemies.Use different tactics for different levels with differentenemies to defeat them and progress in the arena.Multidirectional shooting independent to movement and momentumallowing you to slay more enemies chasing you.Demonwar Survival is the first in a line of more titles we wouldlike to bring you, please give feedback to help us give you thebest experience in this and future games. Doomsday simulator.Tense post apocalyptic atmosphere.Heavy arsenalof weaponry with rocket launchers and Gatling minigun!The time hascome. The whole century passed after the third nuclear war. All theenemy races are about to begin the 4th war. The polluted air isstrained.Leave your shelter and try to survive for the last days ofthe damned planet. You are trapped in the small piece of dirt andmud in the middle of desert, with mad bandits in the city andfierce robots on the way out.Upgrade your survival and marksmanskills to get some better chances of living one more day. Getbetter equipment and get ready to assault robots.Don’t let theplanet kill you first! Skyblock Island is the unique multiplayer hit you don’t want tomiss! Combining strategy, and FPS into an action packed arenashooter where you must choose your cards wisely and shoot first!Annihilate your opponents in one-on-one brawls where good strategyand quick reflexes are key to survival! BRING YOUR CARDS TO BATTLEBring powerful heroes or explosive spells locked away in uniquetrading cards for you to collect! Shape your deck before the battleand see your strategy blow your enemy away! Find the cards that fityour play-style and put them to the test in one-on-one skirmishesin tight and deadly arenas! REAL-TIME MULTIPLAYER FIRST PERSONSHOOTER Make your strategy, then shoot your way through dozens ofhigh-octane maps as you destroy the opposition! Choose your Hero,upgrade your troops, then bring them to the arenas where you willdodge, shoot, and destroy! Features: Multiplayer Choose your heroPlace your troops and win against your opponents Upgrade your cardsIn app purchases for spell and unit upgrades A lot of incredibleweapons and skins! Do what you want with many other survivorplayers in Online mode. Explore radiation island occupied byzombies. Find weapons, drinks, woods, metals, redstone, cloth forbandages etc.. You’ll hunt zombie from single player mode to onlinesurvivor Multiplayer server to play with others!Begin your action radiation survival game on the island withrandom survivor or friends online in Multiplayer mode.Try to survive on the unturned world! Find different resources, useyour woods, metals and redstones for craft new items and build yourwhat you want to survive! Watch out zombies, demons and otherplayers to save your health and make sure you eat enough food. Makea fire to help you survive. there is also lots of new aspects ofsurvival that make this a realistic fun online multiplayer survivalgameFeatures:* Craft your collected items and use them to your advantage* Brilliant graphics and stimulating sound will always keep youenergized,* You will get back up of heaps of supportive items: ignite yourprospect of action survival,* Comfortable visual effect: the game is set against a vibranttheme, which will keep you enticed on your screen,* You can play the action zombie survival game either inmultiplayer mode or in single player mode: enjoy the tale ofsurvival game with its awesome dynamics. * Enjoy smooth control and be the pro against zombie attack: savethe unturned world and set the law of survival for thefittest. 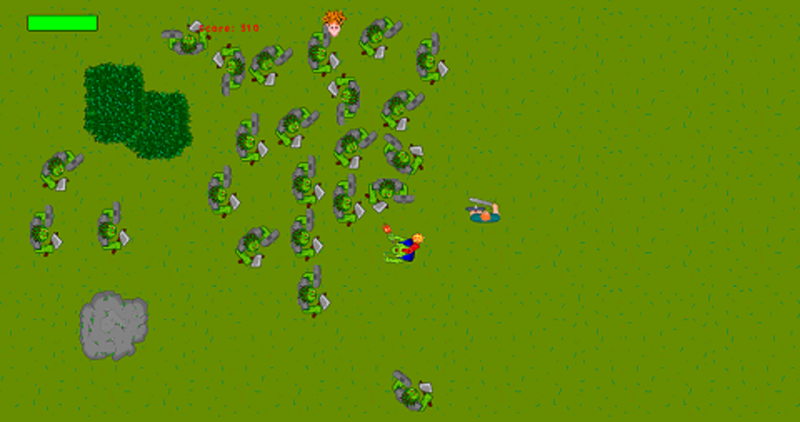 * Track your foes: with special sensor check the action movement ofthe zombies and demons around! Hunt them before these demons killyou. * There is facility of accessing huge area map to understand thewar ground: available both for single play game and multiplayergame. * You will get scope to check your food, drink at stock! you willbe able to check your life,* After each session you will be able to check your score includinghow many zombies you have killed and how many times you were killedby zombie attack! * A lot of weapon( colt, sniper, m79, h1z1, axe, mace)* Crafting & Inventory System* Tons of item for survival craftDownload this pocket survival game online on your android deviceand play with world! You will surely have a wonderful time now onyour android device in hunting zombies! This game can be played onmobile and tablet. You will require hi speed internet to play wellthis Game of Survival in multiplayer mode.